The refurbished Advent Roma 1000 Refurbished Laptop is affordable yet extremely powerful, offering an excellent all round spec to tackle everyday tasks with ease. Enjoy simplified desktop navigation, faster and more secure web browsing and a powerful media centre thanks to the brilliant new Genuine Windows® 7 Home Premium operating system. 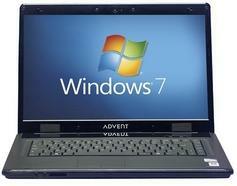 This refurbished laptop has been professionally checked, tested and repackaged. It comes with a reassuring 12-month warranty and offers fantastic savings over its pristine equivalent. At the heart of your refurbished Advent Roma 1000 Laptop is the efficient Intel Celeron processor C900 for smooth performance on your daily tasks. This is helped along by 3GB Memory, while the 160GB Hard Drive provides you with storage space for thousands of photos, music tracks, text documents and more. You can kick back and watch a movie thanks to the DVD Rewriter drive, which is complemented by the 15.6” widescreen display. It also comes with HDMI connectivity. Other notable features of the refurbished Advent Roma 1000 Refurbished Laptop include wireless capabilities and an integrated webcam for a more personal chat experience. It has a battery life of up to 2 hours after every charge – enough to enjoy a feature length film whether at home or on the move!